Today sees the worldwide reveal of the Honda Civic Type R Concept modelwhich points to the styling direction for the exterior design of the highly-anticipated production new Type R that will debut in Europe during 2015. Described by the design team as a ‘racing car for the road’ rather than a high performance version of a road car, the new Type R looks set to signal a new era for the marque – with the most extreme Civic Type R yet. The sleek and aerodynamic profile reflects a car designed for performance whilst maintaining the look of a road car and the distinctive character of Type R.
The styling of the car is heavily linked to performance, with the Type R Concept clearly showing its credentials in the exterior design. Many of the styling features offer real performance benefits, in addition to aesthetics, as confirmed by feedback from prototype testing at the famous Nürburgring Nordschleife in Germany. The shape and angle of the stand-out rear spoiler, for example, has been designed to provide additional downforce, as a direct response to information gained through track testing. Additionally, the upper and lower front grilles have been enlarged and air outlets on the bonnet provide cooling for the high-output engine. The front and rear fenders have been widened to accommodate 20-inch tyres and air outlets are integrated to optimise airflow. When combined, these features deliver maximum cooling, greater grip and ultimately, optimum performance. While further detail on performance is yet to be announced, Honda has confirmed that the forthcoming new Type R will be the first model in Europe to feature one of its brand new VTEC TURBO engines from the Earth Dreams Technology range. The two-litre, direct injection, four-cylinder turbo is expected to deliver class-leading output of at least 280PS and will be EURO 6 compliant. While turbo engines have not been seen in Honda’s production cars in Europe for some time, Honda has continued to actively develop turbo technology on the race track and in other regions. Honda’s successful return to WTCC in 2013, has been instrumental in gathering knowledge that has helped shape the new Type R, providing the development team with analysis and feedback on performance and styling collected from the track. To view the Civic Type R Concept teaser film before the live unveil at the Motor Show, head to the Honda UK YouTube Channel or keep up with all the news by following #TypeR. Honda is also using the 2014 Geneva Motor Show to showcase the powertrain layout of the next generation NSX, set to launch in 2015. Alongside this, Honda’s next generation Fuel Cell Electric Vehicle (FCEV) Concept, makes its European debut at the show, with the company confirming for the first time that the production version will be on sale in Europe from early 2016. Thrilling, sporty products are part of Honda’s DNA. In addition to the introduction of a new NSX, Honda can confirm the development of an all-new Civic Type R for Europe. The Type R brand has a passionate following from Honda customers and the new model will again aim to set new standards in performance and handling. 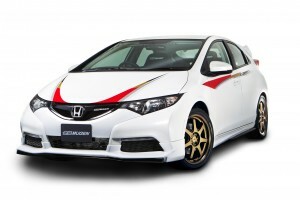 Following a successful programme launch at Goodwood Festival of Speed 2011, Honda (UK) has joined forces with “MUGEN Euro”, to launch a 130+mph sports hybrid CR-Z, boasting Civic Type R performance. 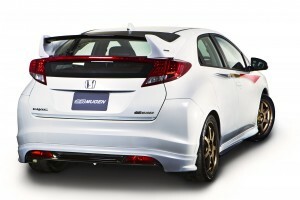 With almost 50 per cent more power than the standard car, this 175 PS1 ‘pocket rocket’ hybrid marks the strengthening of the engineering partnership between Honda (UK) and MUGEN Euro following the limited edition Civic Type R MUGEN in 2010. MUGEN Euro engineers ‘breathed over’ the 1.5-litre power unit, retaining the 3-button IMA modes, adding a centrifugal forced air induction system, charge-air cooler and induction system and importantly, a MUGEN Euro-mapped ECU. The result is outstanding power to weight, and increased torque helping to deliver 0-62mph in 6.1 seconds – over 3 seconds quicker than the standard car. Production development continues at MUGEN Euro, with cars available for test drive through the eight Honda UK MUGEN dealers in spring 2012. Prices have yet to be confirmed, but are expected to be approximately £24,0001. 9th Gen Civic Models Revealed! Honda has revealed prices for the new 2012 Civic will range from £16,495 OTR for the entry-level 1.4-litre 100PS i-VTEC SE and from £26,595 OTR for the top of the range Civic 2.2 i-DTEC EX GT. The car will also be available in the familiar SE, ES, EX and EX GT trim levels offering customers generous equipment as standard. The new 2012 Civic was unveiled at the Frankfurt Motor Show last month and order books at Honda dealerships are now open with cars arriving in dealerships during January. Standard equipment new to the Civic includes, Honda’s Intelligent Multi-Information Display (i-MID) 5-inch dashboard screen which displays relevant driving details such as mpg, the idle stop status and climate and audio settings. Other new additions include a rear wiper, daytime running lights and a headlight-off timer that maintains illumination for 15 seconds after the car is locked. In addition, every new Civic comes with Idle Stop fuel-saving technology (manual transmission only) and an ECON switch for the first time. The ECON switch is already found in the Insight and Jazz Hybrid and activating it tells the car’s management system to adopt specific settings to improve fuel consumption. It does so without affecting overall safety levels or the general usability of the car. The entry-level SE trim also includes 16-inch alloy wheels, automatic air-conditioning and USB connectivity for compatible MP3 audio devices. However, for an extra £1,500 – making the price from £17,995 OTR – they can have the same spec but benefit from the extra performance of a 1.8-litre 142PS i-VTEC petrol engine. For diesel fans, the Honda Civic SE is available with a refined, powerful 2.2-litre 150PS i-DTEC engine and costs from £20,095 OTR. The ES specification is priced from £18,995 OTR when paired with the 1.8-litre petrol or from £21,095 OTR for the diesel. It features all the equipment found in SE and adds a host of features which are new to the Civic range, including cruise control with a speed limiter, rear view parking camera, keyfob-operated windows and door mirror folding, plus auto up/down electric rear windows. Additional kit on ES includes dual-zone air-conditioning, BluetoothTM Hands Free Telephone (HFT), front fog lamps, auto headlights and wipers, leather steering wheel and gear knob, ambient interior lighting and 6 speaker audio system. Available on SE and ES trim levels from March 2012, the T-Grade package costs £995 and adds extra equipment to the specification including integrated satellite navigation with full European mapping and touch screen. EX is the third of the four trims and comes with leather upholstery with heated front seats and a HDD satellite navigation and premium audio system as standard. It costs from £21,745 OTR with the 1.8-litre petrol engine and from £23,845 OTR for the 2.2-litre diesel. The flagship of the all-new Honda Civic range is EX GT, priced from £24,495 and £26,595 for the petrol and diesel respectively. New to the Honda Civic range are smart (keyless) entry/ignition, front and rear parking sensors, bi-xenon HID headlights and lumbar support. Also included on EX GT is all the equipment found in the EX plus a panoramic glass roof, 17-inch alloy wheels, privacy glass, auto-dimming rear view mirror and sunglasses holder. For the first time Honda’s Adaptive Cruise Control (ACC) and Collision Mitigation Braking System (CMBS) are available in the Civic range. This advanced technology is available as a package in EX GT specification only for an extra £1,900 OTR. All models come with a six-speed manual transmission as standard. However, the 1.8-litre petrol can be specified with a five-speed automatic gearbox for an additional £1,385. Built at Honda’s state-of-the-art manufacturing facility in Swindon, Wiltshire, the new 2012 Civic will offer customers high-quality fit and finish using first-class materials and with Honda’s unparalleled reputation for reliability, it will provide years of peace-of-mind motoring. Order books at Honda dealerships are now open and cars will arrive in dealerships during January. FIRST IMAGES OF NEW HONDA CIVIC RELEASED! Honda has released the first exclusive photos of the new Civic. The images show the new clean, dynamic and flowing exterior design and high quality interior. The designers of the new Civic wanted to keep the sporty and advanced elements of the car’s character but tailor them to communicate the new model’s more dynamic feel. Sources of inspiration included a ‘blended wing body’ aeroplane in which the fuselage and wings blend into a single body for superior aerodynamic performance. Nearly all of the body components on the new Civic have been redesigned with particular focus on ride and handling, reduced CO2 emissions, design and interior quality, while retaining the class-leading cabin, boot space and practicality. Designed and developed specifically for the European market, the new Civic will be offered as a five-door hatchback and will reach UK showrooms in early 2012. The new Honda Civic will be launched tomorrow at the 2011 Frankfurt Motor Show (IAA).